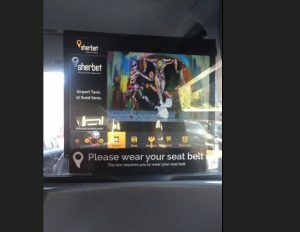 Advertising on Sherbet new Electric taxis is the perfect Out of Home Campaign match for Gemfields, who are a leading supplier of responsibly sourced gemstones. 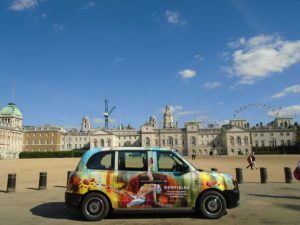 Outstanding creative livery distinguishes itself from others with colorful painting-like artwork showcasing shiny Rubies and Faberge Egg. 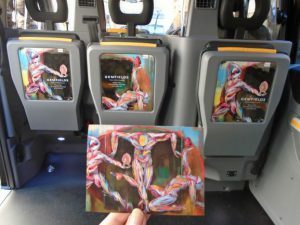 Campaign also includes specially designed tip up seats adverts, taxi receipts and video adverts displayed on taxis digital screens. 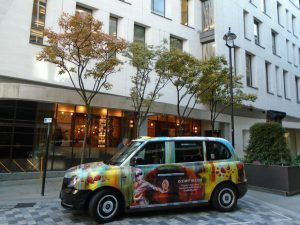 As with almost every taxi advertising campaign we provide an executive VIP PR service available to use for our clients as they wish. 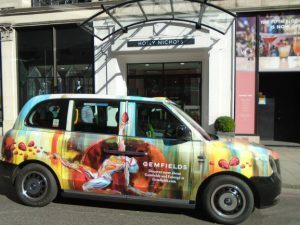 Gemfields chose to showcase their stunning electric taxis at the Regent St next to their office. 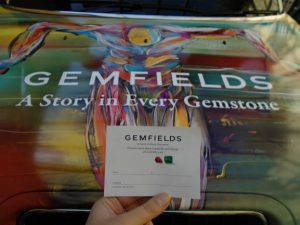 With that, we have provided a chauffeur service to the Gemfields team. 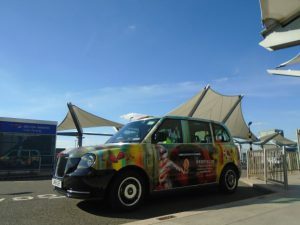 We are looking forward to work with Gemfields, Havas and AdCity again in the near future delivering outstanding out of home taxi campaigns such as this one.